Alfa Romeo: cars you can't buy | What Car? 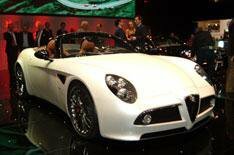 Alfa has also unveiled the convertible version of its arresting 8C Competizione sports car. The 8C Spider shares the same engine as the Coup, a 4.7-litre V8 that produces 450bhp. All that power reaches the wheels through a Formula-One-style six-speed paddle-shift gearbox. The car has a fabric roof, which is deployed electrically by touching a button on the dashboard, and the roof can be personalised in various colours to suit the car's body colour. Prices haven't been revealed, but the Coup costs 110,000, so it will be considerably more than that. In any case, it's probably academic Alfa Romeo is making only 500 8C Spiders, and, if the Coup is anything to go by, they will probably be sold out before it goes on sale.